← iTunes — can’t download all updates? Here’s the workaround! This is going to be a major pain for a lot of people, including me! One of the main reasons I do Cmd-Q (Quit command) is precisely because I want the app to open in a default mode and not to re-open what I was just doing. This is particularly the case if an app goes a bit squiffy or is just not doing what I want it to do. 1. Go to the Apple icon in the top left and choose ‘System Preferences’. 2. The first icon at the top is ‘General’. Choose that, then look down the bottom for an option that says ‘Restore windows when quitting and re-opening apps’. You need to UN-check that box to turn of Resume. By default, this will always be checked, so you’ll have to remember to un-check it every time. Alternatively, you can install and run a script to make this dialog box ineffective (it’ll still show it’s checked, but it won’t work). This is not an ideal solution since it means that if you forget (or someone else using your machine doesn’t know), there’s no indication that the feature is ‘off’. However, if you’re desperate to make sure this feature is off, this looks like the best option so far. 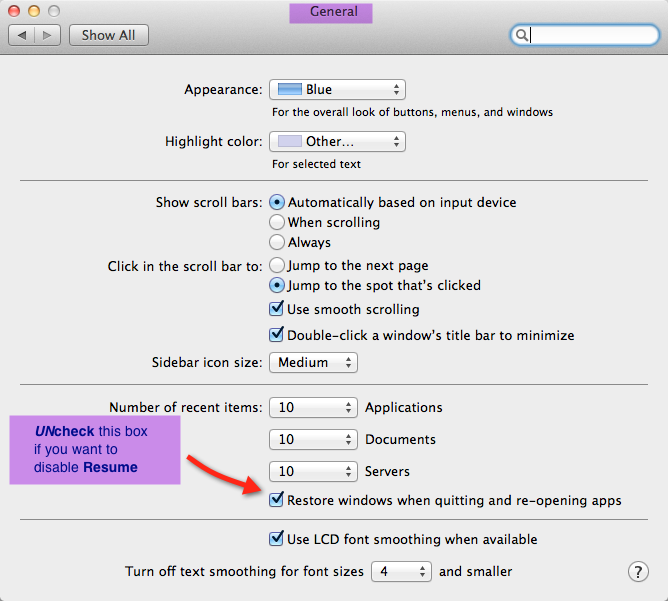 Posted on July 21, 2011, in OS X Lion and tagged disable resume, Lion recover, open default view, Option key, Resume, turn off Resume. Bookmark the permalink. 5 Comments. None of the above has worked for me or my wife. Will someone be fixing this? We need a PERMANANT Resume disable command. Thank you! This “feature” has been very annoying. The link to the Versions article doesn’t work. This checkbox in the general preference panel only keeps applications and documents that have been quit (normal Quit- cmd-Q is fine) from resuming when one restarts or logs on. Anything that was left open when the user logged out will resume regardless of the choice in the preference panel. Yes, you’re right. 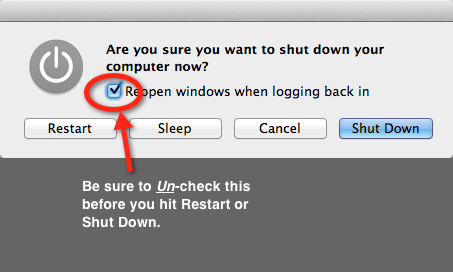 If you restart the whole system, Lion will re-open any un-quitted apps (i.e., restore them). However, there’s a way round this which I’ve now included in the main body of the post.